Global oil prices have tumbled almost 60 percent since June, hitting five-year lows as growing production and tepid global demand has caused a supply glut and prompted oil producers to scale back spending. 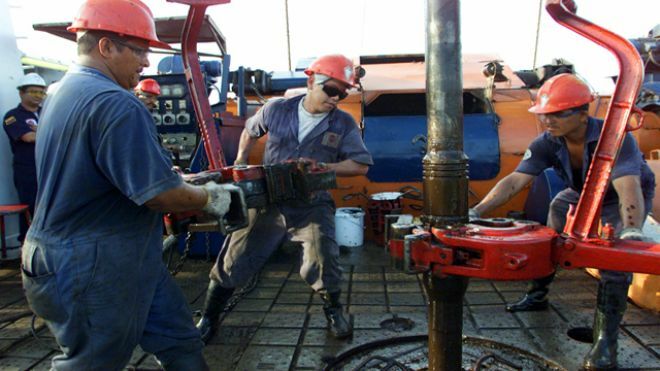 Oilfield service providers Baker Hughes Inc and Halliburton Co plan to cut thousands of jobs as drilling activity slows further due to a steep fall in crude oil prices. Baker Hughes, which is being acquired by Halliburton in a near-$35 billion deal, said earlier in the day it would lay off 7,000 employees. Days before the industry leader Schlumberger NV said it would cut 9,000 jobs, underscore the abrupt slowdown in drilling activity seen in the past two months. Adding up numbers we get 17,000 laid off workers (read more). ← Will the US Rule the Oil Market?